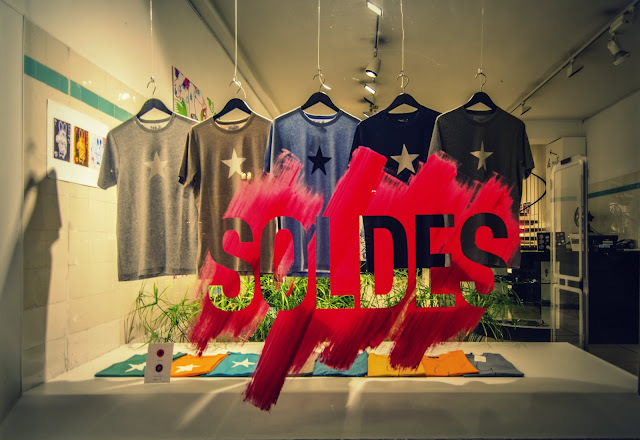 It's the soldes again (the sales) and everywhere in Paris you can find signs like this in store windows (I took this photo in the Agnès b store). This year you can make really good bargains as stores still have a lot of summer inventory: 1) because the weather has been terrible these past months and 2) because the economy is pretty bad at the moment and the French prefer to save than to spend money ! And twice a year, I wish I was in France to take advantage of those sales. One of your best Soldes photos ever.